Lamar Odom made his first appearance since his near-fatal overdose at Kanye West’s fashion show and concert on Thursday. As Gossip Cop has reported, Odom was found unconscious and unresponsive at a Nevada brothel last October. The former NBA star spent several days hospitalized in a coma in Las Vegas before regaining consciousness and being transferred to Cedars-Sinai Medical Center. He was released from the L.A. hospital in early January. Since then, Odom’s recovery has been described as nothing short of miraculous. Despite initial questions on whether he would even survive the medical emergency or if he would suffer extensive, permanent brain damage, the athlete is slowly returning to an active lifestyle. With therapy for walking and speaking, he’s been able to engage in conversations and even go on a hike. Now on Wednesday night, he made his first cross-country trip since the health crisis began. 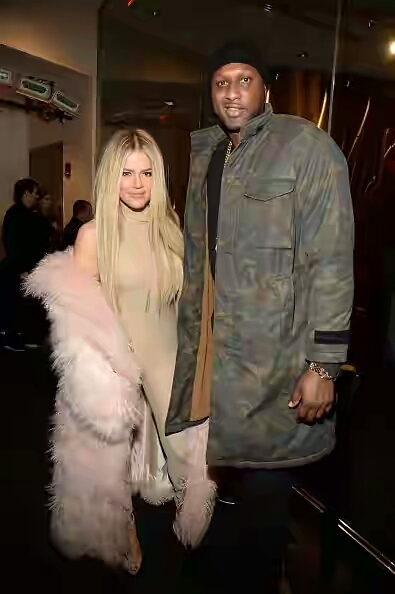 Joined by estranged wife Khloe Kardashian, who has been by his side through this difficult process, Odom flew from L.A. to New York City for West’s “Yeezy Season 3” event in New York City, where the rapper was premiering his new album and revealing his latest clothing collection. The men are said to have bonded over West’s music over the last few months, leading Odom to score an invite to the exclusive concert/fashion show. Odom showed gratitude toward his pal, and now he’s showing the world just how far he’s come in his recovery just four months after the incident. Along with Kardashian, the basketball player was at West’s bash Thursday with Kim and Kourtney Kardashian, as well as Kris, Kendall, and Kylie Jenner.